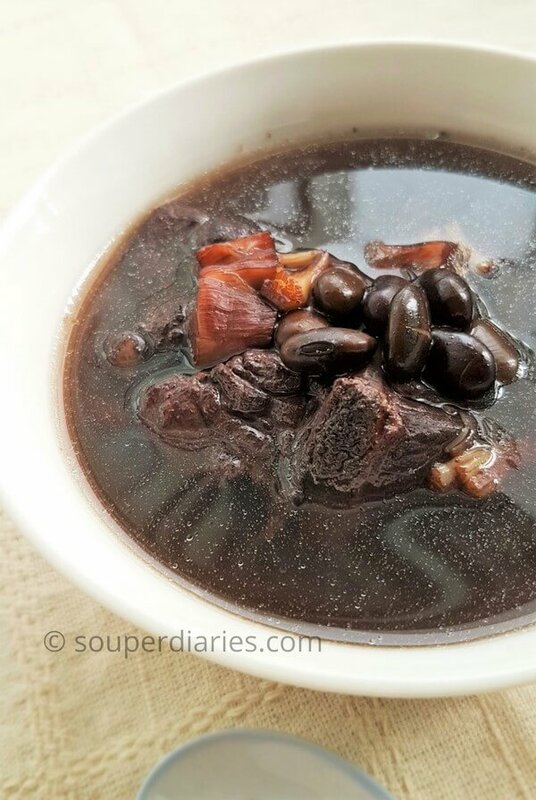 When I was pregnant with my children and also after giving birth, I would take black bean soup (黑豆汤) regularly as black beans reputedly nourishes the blood and is also good for maintaining overall health. 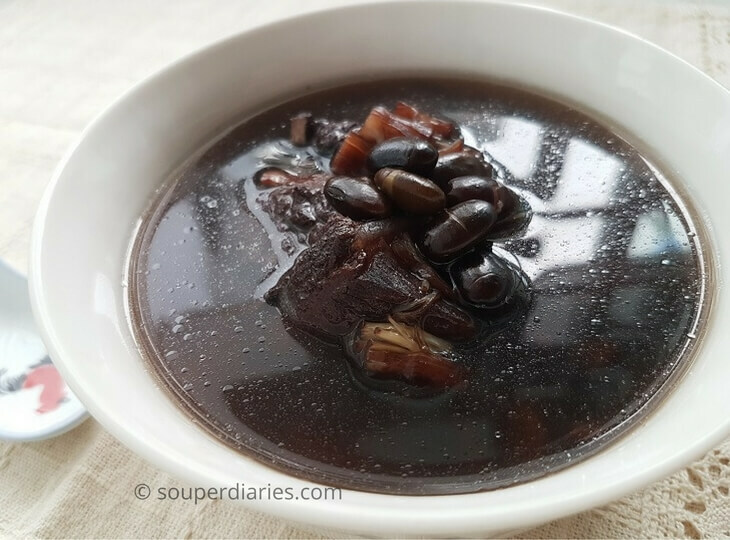 This Chinese black bean soup is a popular soup for Chinese ladies in confinement and it is also suitable for men and children as well. 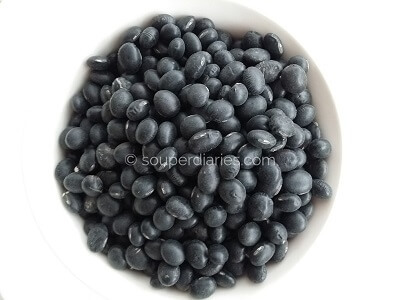 Black bean (also known as black turtle bean) have a dense, meaty and mushroomy taste. Some people focus on the soup alone but I find that the beans really fill me up and I enjoy eating them together with rice. Black beans are not only delicious but they are prized for their rich source of protein, fibre and antioxidants. These affordable beans are packed with essential vitamins and minerals like folate, copper, magnesium, phosphorus and B Vitamins in addition to others. These beans are also a great food choice for vegetarians and vegan dishes as they are a good meat substitute. Eating black beans is a great way to add low fat and high fiber protein to your diet. It helps to make you feel full, keep your energy up and more. Be sure to cook with fresh black beans so that they will soften easily when you cook them. Old and tired beans will take ages to soften and sometimes, may never soften. Don’t buy beans of any type in bulk unless you plan to cook them regularly. You won’t be able to spot the “good beans” from the “bad beans” till they’re cooked. Dried ingredients are commonly used in slow-cooked soups to improve the flavor. You can use the following to sweeten this soup naturally: dried scallops, dried honey dates (this is inexpensive and effective), dried red dates and dried cuttlefish. The black beans themselves are mildy sweet so all this combination of ingredients make for a really hearty and flavorful soup. I love that it is so tasty and easy to make. Chinese black bean soup. An invaluable tonic for both young and old. For more easy and healthy Chinese homecooked soup recipes, check out my slow cooking soup recipes and quick soup recipes. This simple soup replenishes your blood cells and is also excellent for menstruating women as it helps to build up and replace lost blood. Blanch pork ribs in a small pot of boiling water to remove scum. Remove pork ribs from pot and set aside. Combine all ingredients in a soup pot and bring to a rolling boil for 10 minutes. Then simmer on the lowest flame for about 2 hours or until the meat and beans are soft and tender. 1. Do not boil for too long or the liquid will reduce significantly. 2. You can also cook this soup in a slow cooker. This looks not only delicious but also nutritious Yvonne. I will make it for my family. Thanks for sharing. Love your recipe. Can add black fungus too ? I’ve not tried adding black fungus before into this soup. I love having beans, especially cooked in different ways. I have diabetes and beans are excellent for us. Here is an article I did about beans and the many health benefits, especially for diabetics. Maybe you have a recipe for the cannellini bean? Thanks for sharing, Josephine. I don’t think I’ve tried cannellini beans before. Or maybe I have but it was a long time ago. I love beans too and some of my favorite are black beans, pink beans (also known as cranberry beans), green beans and red beans. Do check out my recipe for green bean dessert soup here. It’s very easy to make, healthy and delicious. I am also a Chinese and I have had this soup before, just saying that this soup tastes very good and it’s really nutrient and good for people who are low on energy. Oh yummy chinese black bean soup! I am going to make this in my slow cooker and see how it turns out. I love this budget friendly recipe too. I notice that there’s no salt in the recipe, how come? Wouldn’t a bit of salt balance it out or is it suppose to be sweet? This sounds like an interesting recipe. I am always looking for something different for my family to try, especially if it is high in protein and low in carbs. I could easily put this in my slow cooker in the morning and let it cook until supper time. I love meals like that! This soup looks amazing! I’m taking down the recipe now. I love that it has so many nutritious benefits and is also very cost efficient and convenient to make.